SOUTHERN OCEAN, February 20, 2013 (ENS) – The Japanese whaling factory ship Nisshin Maru has collided with two whale conservation vessels and its own refueling tanker in Australia’s Antarctic waters, damaging the other ships. No injuries are reported. Images transmitted by the whale defense group Sea Shepherd show the Nisshin Maru scraping the stern of the tanker ship Sun Laurel and striking the Sea Shepherd ships Bob Barker and Steve Irwin. The collisions, near Australia’s Davis Station, came on Wednesday afternoon local time as the Nisshin Maru was trying to get close enough to the Sun Laurel to take on fuel. The Bob Barker was hit in the stern and was taking on water in the engine room. Now, however, the leak has been controlled and Bob Barker Captain Peter Hammarstedt has withdrawn the mayday distress call he issued at the height of the skirmish. Sea Shepherd’s flagship Steve Irwin was hit multiple times by the Nisshin Maru, according to the group’s founder Paul Watson, who is onboard as an observer. “The Nisshin Maru struck the Steve Irwin twice and struck the Bob Barker multiple times, and then also smashed into the side of their own tanker, the Sun Laurel, causing damage to the Sun Laurel,” Watson said. “They’re frustrated we’ve prevented refueling operations for two days,” he said. “There was a moment when Nisshin Maru came in and I was completely unable to move out of the way, even if I wanted to,” Hammarstedt said. Hammarstedt said the Japanese vessel hit the Bob Barker several times before withdrawing. “They realized they could either back off or kill everybody aboard ship,” he said. Watson says Japanese crewmembers threw stun grenades at the Sea Shepherd ships, but he said none of the 42 people aboard the Steve Irwin or the 34 crew on the Bob Barker was injured. The South Korean-owned, Panamanian registered Sun Laurel, a vessel that the Sea Shepherd crews have documented leaking a trail of oil into the sea inside Australian Antarctic Territorial waters, is attempting to refuel the Nisshin Maru with heavy fuel oil. “It’s illegal to transfer heavy fuel below 60 [degrees] and we’re 300 miles below 60 and we’re about 180 miles from the Australian Davis research base,” Watson said. 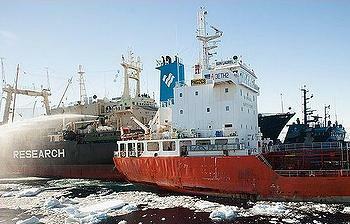 Hansen says the Japanese whaling fleet and its contract refueling tanker Sun Laurel are in violation of the International Convention for the Prevention of Pollution from Ships (MARPOL), the main international convention covering prevention of pollution of the marine environment by ships from operational or accidental causes. Because of these violations, the Sea Shepherd ships have blocked attempts by the Nisshin Maru to refuel from the Sun Laurel. “We are deeply concerned of the potential for a massive oil spill and ecological disaster in the pristine Antarctic wilderness, off Australia’s Antarctic coast in Australian waters,” said Hansen. 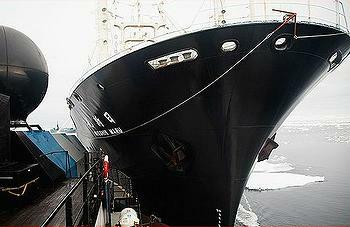 The Sea Shepherd’s Southern Ocean campaign is being run by its Australian branch this season. 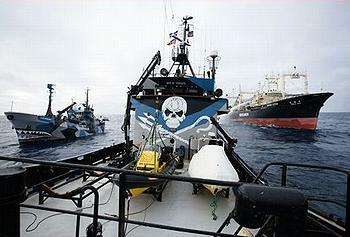 The transfer of authority took place at the end of December in compliance with a restraining order issued by the U.S. Ninth Circuit Court of Appeals December 17 banning Watson and the U.S. branch of the Sea Shepherd from approaching within 500 yards (457m) of the Japanese whaling vessels. Due to that order, Watson resigned from all positions within the organization he founded in Vancouver, Canada in 1978.
vessels,” the Japanese agency said. The Japanese claim the Sea Shepherd vessels attacked them on February 15 as the Nisshin Maru and the “research vessel” Yushin Maru No. 2 were trying to transfer a sampled whale to the Nisshin Maru, NM. “During the attack, the NM and the YS2, besides using their water pump as a preventive measure to make SS desist from further approaching, repeatedly broadcasted a warning message to stop them. Further, in order to secure safety, the NM and the YS2 towed from their stern a safe-distance warning rope and buoy to contain the BB closing in, but the ropes were cut off by activists. There were no injuries or damage to the Japanese crews and vessels,” said the Institute. After several attempts the sampled whale was transferred to the Nisshin Maru. Because the Sea Shepherd vessels have kept them on the run, this is likely the only whale the Japanese whalers have been able to catch this season of their self-assigned quota of 950 minke whales, 50 endangered fin whales and 50 humpback whales.